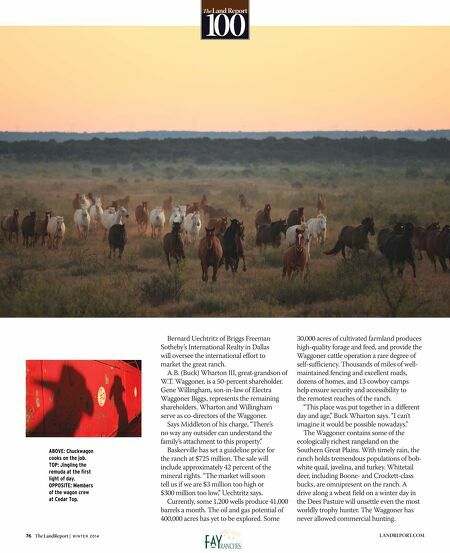 Bernard Uechtritz of Briggs Freeman Sotheby's International Realty in Dallas will oversee the international effort to market the great ranch. A.B. (Buck) Wharton III, great-grandson of W.T. Waggoner, is a 50-percent shareholder. Gene Willingham, son-in-law of Electra Waggoner Biggs, represents the remaining shareholders. Wharton and Willingham serve as co-directors of the Waggoner. Says Middleton of his charge, "There's no way any outsider can understand the family's attachment to this property." Baskerville has set a guideline price for the ranch at $725 million. The sale will include approximately 42 percent of the mineral rights. "The market will soon tell us if we are $3 million too high or $300 million too low," Uechtritz says. Currently, some 1,200 wells produce 41,000 barrels a month. The oil and gas potential of 400,000 acres has yet to be explored. Some 30,000 acres of cultivated farmland produces high-quality forage and feed, and provide the Waggoner cattle operation a rare degree of self-sufficiency. Thousands of miles of well- maintained fencing and excellent roads, dozens of homes, and 13 cowboy camps help ensure security and accessibility to the remotest reaches of the ranch. "This place was put together in a different day and age," Buck Wharton says. "I can't imagine it would be possible nowadays." 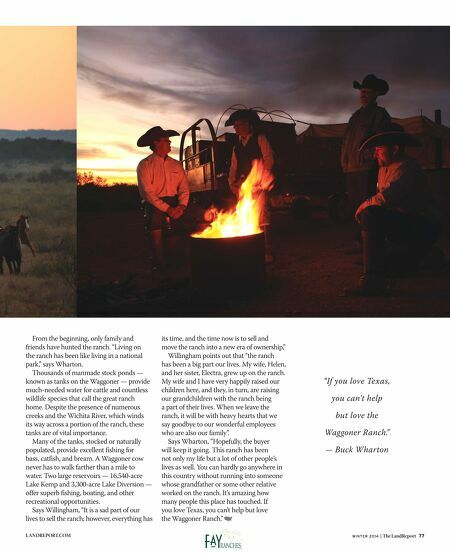 The Waggoner contains some of the ecologically richest rangeland on the Southern Great Plains. With timely rain, the ranch holds tremendous populations of bob- white quail, javelina, and turkey. Whitetail deer, including Boone- and Crockett-class bucks, are omnipresent on the ranch. A drive along a wheat field on a winter day in the Dees Pasture will unsettle even the most worldly trophy hunter. The Waggoner has never allowed commercial hunting. 76 The LandReport | W I N T E R 2 0 1 4 LANDREPORT.COM The Land Report 100 ABOVE: Chuckwagon cooks on the job. TOP: Jingling the remuda at the first light of day. OPPOSITE: Members of the wagon crew at Cedar Top.